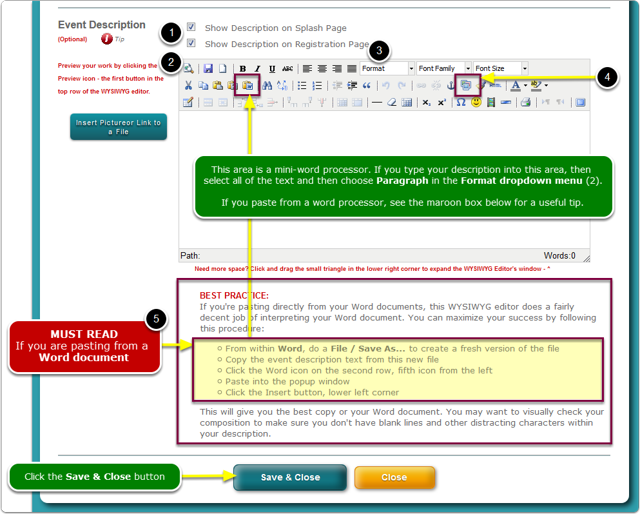 Help Documents - Version 5 Where do I start?How do I add an Event Description? Where does the Event Description appear on the registration page? 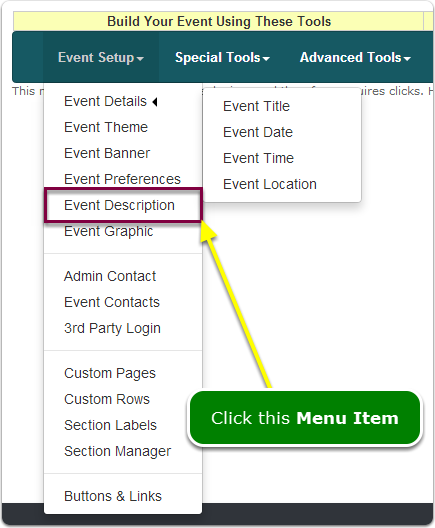 If you have used the Theme Editor to apply a color scheme to your event pages, then you also applied font styles. Therefore, whatever changes you make to font styles in this tool, such as font face, size, color, bold, etc, they will override the color theme settings. BEST PRACTICE: change as little as possible in this tool. Usually, bolding a word, changing the color of a sentence, increasing the size of a title are the only changes you will need to make to text here. If you're pasting raw text into this WYSIWYG editor, be sure to select all of it and choose Paragraph in the dropdown menu (3). Prev: How do I add an Event Graphic? Next: How do I change the Event Date?